Coupon codes have evolved slowly in the Affiliate Marketing industry, but now represent a new realm of opportunity and optimization. Use these five actionable tips into web lead form best practices and optimization techniques to help convert your customers. Take what you know and make a positive difference in someoneâ&#x20AC;&#x2122;s life. Whether your priority is lead generation, brand awareness or positioning, our Exhibitor and Sponsorship packages are designed to connect you with your target audience at Affiliate Summit East 2019. Co-Publishers Missy Ward, Shawn Collins Contributing Writers Ricky Ahuja Katy Atlas Vera Belinskaya Debbie Bookstaber Danna Crawford Suresh Dakshina Susanne Eberl Kevin Edwards Adam Enfroy Sarah Gulbrandsen Dustin Howes Choots Humphries Zac Johnson Brandon Myers Corey Padveen Stephen Robinson Maria Sparagis Mark Standfield Robin R Talbott Chris Tredgett Jonathan Weberg Priest Willis Sr Matthew Woodward Tom Wozniak Ryan Zimmerman Graphic Design Andy Medley for YMP www.youngsmedia.productions Magazine Coordinator Cruz Alvarado Affiliate Summit 35 Nutmeg Drive, Trumbull, CT 06611 tel (417)-2SUMMIT (278-6648) fax (908) 364-4627 Articles in FeedFront Magazine are the opinions of the author and may not necessarily reflect the views of the magazine, or its owners. FeedFront Magazine always welcomes opinions of an opposite nature. © 2019 Affiliate Summit, Inc. and Individual Authors. that were related to school, such as founding a profitable newspaper for the Greek system, holding offices in my fraternity, balancing budgets, dealing with school and city officials, and other real world experience. While many tech companies, including Apple, Google, and IBM do not require a degree, there are still a great many companies that do mandate one for consideration. If I was doing it all over again I’d still go to college, and I’m encouraging my kids to do the same if that’s the path they want to take. Since each of my four kids was born I’ve funded 529 plans for each of them to be covered for four years at a state school. My firstborn is a college sophomore and my second is taking her SATs. I didn’t learn what I wanted to do until my late 20s, so I want them to make their own. 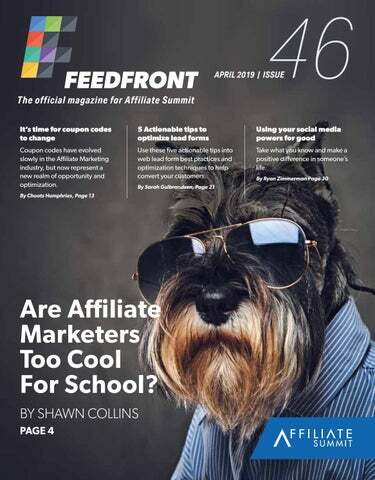 [FF] Shawn is Co-CEO of Affiliate Summit and Co-Editor-in-Chief of FeedFront Magazine, and blogs at affiliatetip.com. “Welcome to the program”, said the affiliate manager to the affiliate… and then there was silence. The next day the AM (affiliate manager) was too busy to reach out with a personal hello, even though the affiliate’s website had a lot of potential. A week later the AM had forgotten all about the affiliate, and the affiliate had already moved on to other things. The end. Does this story sound familiar? This tragic tale happens daily in the affiliate world. Many affiliate programs do not take the time to construct a welcome sequence to help affiliates promote the brand. But it’s 2019 and we live in a drip campaign digital world, so don’t fall behind. Here are four reasons you should be sending emails from your in-house emailing tool. 1. No Limitations One of the biggest hurdles an AM faces is that networks/ platforms have limitations to the amount of emails a company can send out when the affiliate joins the program. Most affiliate networks today will allow you to download a list of contact email. Download a list daily of the newly joined affiliates and insert them into your in-house email system. Instead of just one “thanks for joining” email, you can send affiliates a series of emails. For example, email one gives the affiliate their unique tracking link and email two (the next day) explains the best ways to promote your brand. 3. Time Management An AM has roughly 20 different tasks to complete throughout the day. Emailing affiliates after they apply is a task that often gets put on the backburner. Do not miss the opportunity to connect with a high potential affiliate. A drip campaign is going to save you time and help fill your inbox with potential. 2. Boldly Brand and Stand Out You ever send a newsletter out from the network? The base templates usually look like hot garbage, so unless you create a nice HTML template, it’s going straight to the affiliate’s trash can. However, your in-house emailing system probably has some real nice branded templates that you can utilize to stand out. Beautifully crafted emails are going to see higher open rates, click-through rates, and response rates. For many email marketers, running a program that is compliant with CAN-SPAM is seen as a legal requirement, whose main benefit is avoiding potential fines or other legal penalties. However, running a compliant email program leveraging industry best practices has a number of additional benefits. Long-Term Audience Engagement A successful email program goes beyond the results of a single campaign. Over time, a mailer will likely send multiple emails to the same recipients. That long-term relationship is built on the value of the content being sent, how they interact with and listen to recipient signals. Much of that listening comes from monitoring how recipients engage with/respond to emails. When they engage more frequently with a particular type of content, the advertiser is likely to provide more of it in future campaigns. It’s also important to monitor the negative signals they send. One of the most important of those being an unsubscribe request. If a recipient opt-outs of future email campaigns, but continue receiving email messages from an advertiser, they are almost certainly going to react negatively. Beyond the potential fines and legal penalties that come from non-compliance, ignoring recipients’ requests will negatively impact the entire email program. Make the opt-out process simple and honor requests quickly and the email list will be made up of a higher percentage of recipients who actually want to receive messages. This will lead to a more productive email program overall. A constant connection with consumers. Five words that neatly encapsulate the power of publishers to partner with brands through the medium of affiliate marketing. But those words weren’t spoken by us, they’re the sentiment of the world’s most influential marketer, P&G’s (Procter and Gamble) CMO Marc Pritchard, describing his mission to recast the global consumer brand in the digital age. The analogy with the affiliate channel doesn’t end there. Pritchard further explains how P&G is creating a business culture centred on small, agile teams that assume a start-up mentality to build solutions that address consumer demands, much like the huge number of affiliates we work with daily. Over the past 12 months Awin has welcomed almost 17,000 new active publishers to its global network, businesses of all shapes and sizes drawn from across the digital spectrum with their own ideas about how to connect with consumers. Iterating, moulding the latest technology, finding a new, lateral angle; it’s this ability to adapt and evolve that is one of the channel’s greatest assets. The new publisher number is a reassuring statistic in uncertain times. Digital marketing is under greater scrutiny than ever before, and some of that examination will inevitably land at affiliate marketing’s door. But the channel’s strengths, cultivated over the past two decades, are manifested in robust solutions that soothe some of the fears brands currently have. As the number of affiliates continues to grow, so the industry provides a healthy antidote to increased advertising homogeneity through the breadth and diversity of deeply forged partnerships. The channel provides an obvious contrast to the burgeoning dominance of Facebook and Google. Kevin Edwards is the Global Client Strategy Director at Awin. As a marketer, I can’t play in every single market. One of the things I enjoy is sharing my wealth of market insight and pushing my colleagues to be their best. My ideas come out of everything. Most of my market ideas come out of content marketing. I recently met a woman who had holdings in the woman’s underwear space. Her aim was to take her line of inclusive underwear for women from being a local company in Austin into a national brand. It turns out the Victoria’s Secret body isn’t one of the most attainable things in the world. It ostracizes women who have bodies that are completely beautiful, yet never seen in advertising. Like many brands, hers was battling the transition from brick and mortar to online. She was in a desperate fight for survival. It’s a battle Sears, GameStop, Best Buy, Toys “R” Us, and many other Fortune 500 companies have fought. Some have won, at least for now. Others have lost everything. We’ll never see them again. For her, the last few years had been spent transitioning and simply becoming functional. Bookstores publish bestseller lists, music portals create charts, and McDonald’s advertises in the USA with the slogan “Billions and billions served”: popularity as a sales argument. What millions buy is an incentive for millions more. We call this the bestseller effect. In psychology, it is also known as “social proof ”. It’s based on man’s “herd instinct”. Without thinking, we imitate the behavior of others – the group only has to be large enough. The individual assumes that the group is doing the right thing. Following the majority is a strong motive for action. An experiment published in the Wall Street Journal proves the effect: business psychologists were interested in the sales argument that convinced Americans who normally buy air conditioning systems to buy a fan. •	Argument 1 – Save up to $54 a month with one fan. •	Argument 2 – Think about the environment! Avoid 119 kg of greenhouse gases with a fan. •	Argument 3 – 77% of your neighbors already use an energy-saving fan. Most sales were generated with argument 3: it provided social proof. The behavior of the majority is more convincing than the possibility of saving money or doing something for the environment. We will tell you in three steps how to effectively use the bestseller effect for your email-marketing to help you to increase subscribers and sales figures. Take advantage of the contagious effect of popularity. It is an indicator of quality and in addition gives potential subscribers confidence. Step #2 – Use Social Love Besides a large community, also a high number of interactions on your pages in social networks is convincing. If your expert tips, trend news, or offers receive many likes, shares, and comments, then you should definitely spread this proof of your popularity. Social share buttons can be integrated on any product page, above your subscription counter, and even in your promotion mail. Step #1 – Make Your Newsletter a Bestseller Does your newsletter already has a considerable number of subscribers? Make the high number of subscribers visible with a subscription counter. Address your target group directly. For example when it comes to fashion, “Check our weekly trend news like 8,763 fashionistas already did”, or as a financial service provider, “Follow our financial tips like 6,195 experts”. The phrase, “living over the store,” expresses the olde tyme convenience of a merchant having their living space above their retail store. Not only was their commute to work just up a flight of stairs, but family and customers could both be attended. Even with work and home in close proximity, however, there was a clear line drawn between the merchant’s business and their living space. Customers didn’t wander upstairs, while family didn’t eat in the store. Times have changed in many ways, but the line between personal life and business is one still best observed. It’s a rule we affiliate marketers might follow to insure our brand is looking professional and not diluted in its impact, by our personal life. Setting boundaries is confusing, though, because online marketing has moved away from touting product performance to the engendering of relationships between influencers and customers. It is easy to cross the line of too much information (TMI) which may drive customers away or even compromise an otherwise focused impact that would have led to a sales conversion. 1) To purify your brand, leading to a consistent online presence, use the same photo, symbol, and avatar or logo image across all social media, on your web site, business cards, media sheets, and press releases. Images instantly stamp their impact on your prospects better than words, so make sure everything you do has the same representation. A body of undivided visual recognition unifies your efforts. misplayed personal comments can be a distraction to those buying your product or service. 3) Represent your niche and only your niche by interacting within your niche. Limit your interaction to those within your niche circle and niche prospects. Online marketing is time intensive as it is, so focus your efforts. 4) Write in the first person to initiate personal relationships with customers, but remember that customers are business associates, not personal friends. For example, be cautious about joking, in case unknown regional preferences sway your business into a perceived bad light. IS BLOCKCHAIN RIGHT FOR AFFILIATE MARKETING? Affiliate Marketing is already adopting different methods with networks and channels paying alternative to fiat currency on a crypto exchange. By Priest Willis Jr.
What if I told you that we’re only at the beginning stages of a financial revolution and possible intersection with affiliate marketing? You’ve heard of digital currencies like Bitcoin, Ethereum, and Litecoin. In fact there are well over 1,000 coins as of today, and new Initial Coin Offerings (ICO’s) are popping up every day. Many of you have watched the most popular coin, Bitcoin, take a meteoric rise from less than $1K in early 2017 to over $19K by the end of that year. In bust-tastic fashion, Bitcoin dropped to under $4K by end 2018. Still up today by $3k from 2017, this new frontier is still too risky for many. I’m not here to dispute the value or volatility of the coins, but the technology of Blockchain is here to stay. What is Blockchain? A blockchain ledger keeps records of digital transactions. Instead of having a central administrator, like a bank, blockchain organizes data in batches called blocks. These data batches use cryptographic validation to link themselves together (hence blockchain). In other words, each block identifies, and references the previous block by a hash value, forming an unbroken chain. Blockchain solves two challenging problems of digital transactions: controlling the information and avoiding duplication. When a purchase is carried out, the ledger records it and sends it out to the entire network. Computers around the world then compete to confirm the operation by solving complex math equations. The first to figure out the answer and validate the block receives a reward in Bitcoins (known as mining). The validated block is time stamped and added to a chain in chronological order. The entire chain is continually updated so that it’s always an accurate representation of who owns what at any given time. Key factors are that it’s global, irreversible, low fees, private, relatively secure, and open. Ingredients for a future global economy. The Year of Cryptocurrencies 2017 was a landmark year for blockchain, bitcoin, and cryptocurrencies at large, as more individuals, investors, companies, banks, and governments began to recognize its importance. So, what then is cryptocurrency? In layman’s terms, cryptocurrency is digital currency. Just as you have physical currency in Dollars, Yen, Euros, or Pounds, cryptocurrencies are digital versions of these currencies. Consumers have used coupons for online shopping discounts for over 20 years. As consumer demand for online coupons rose, affiliate websites like RetailMeNot. com, Savings.com, and Coupons.com were created to meet and monetize this demand. And, over time, coupon codes provided by affiliates evolved slightly to increase conversion and value to the affiliate marketing relationship. For example, a specific vanity code branded to an affiliate site or a code more easily remembered (e.g., Save10) tends to be more effective than a random code. Coupons specifically designed to increase shopping cart value (e.g., 10% off a purchase of $100 or more) are also used to increase the value of an online transaction for affiliate and merchant partners. These optimization techniques have one thing in common— they represent only minor evolutionary progress when compared to traditional coupons consumers have used for over 100 years. With the plethora of member data available to affiliates today, so much more is possible and significant evolution is inevitable. Coupon and loyalty affiliate companies have much data about their members. This data includes demographic details, as well as purchase habits and interests. Armed with such data, affiliates could significantly optimize further if they had the ability to present coupons specific to each member. Another level of optimization could occur if these affiliates could react to consumer decisions in real-time, but coupon codes for any particular merchant are constrained by a merchant’s shopping cart and the need for that merchant to create coupons manually and significantly ahead of a consumer’s purchase decision. But what would our affiliate marketing world look like if this constraint were lifted? What would be possible if affiliates could create codes on demand that transparently worked in a merchant’s shopping cart? Imagine waking up one morning in another planet – that’s how strange it can be when starting a new role in a new organization. The faces are new, the environment is different. From the lobby to your desk, it is like you are the only one different while everyone else knows one another. This can be very hard – super hard. However, you have got to settle in. Here are some tips to make the transition easier. Be Sociable and Make Friends If there is any skill that can get you many friends within a few days, it is being sociable. Being sociable is being friendly and pleasant to people. By doing this, you offer an opportunity for social interaction. In a new workplace, you need to know your way around and as a new face; the first impression you make can go a long way in deciding how people will interact with you. Making new friends at work will help you know your way around and get things done faster. Your new colleagues have been there before you came around and it is most probable that they encountered one or two issues you’re currently facing. Study the Behavior of People in Your New Team Just as fingerprints are different, so are the behaviors of people. With a new team, getting along takes understanding how differently people react to issues. It might require time and attention but it pays off to know how to go about a conversation with a teammate and how not to with another. Another side to this involves understanding how best your team members work and what interests them. As a new team member, having interactions with your teammates is something you can’t do without. This is where interest comes in. Ask Questions and Assume Less A friend almost started off on the wrong foot with a new manager when he assumed she was married. Thankfully, he was corrected by the secretary that the manager was a “Miss” and not “Mrs.” Actually, the manager took the issue of title seriously. A lot of new employees make assumptions about things they shouldn’t. These have led to serious issues that have necessitated another transition for many. In a place one isn’t used to, it is very helpful to ask questions. No one expects you to know everything when you start, so ask. You will be surprised how eager people are to help. PHONE CALL VS. EMAIL: WHICH IS BETTER? When I started in affiliate marketing in 2005, I would pick up the phone if I needed to reach out to an affiliate. Fast forward to 2019, and it seems that the phone call has become an almost “last resort” form of contact. But is that a good thing? A quick Google search of “email vs. phone call in business” garnered a couple of results from articles in 2014 and 2016, but nothing more recent. However, an article on Grasshopper. com, “Talking to Customers: Phone vs. Email,” provided some interesting stats: •	Phone calls are 10 times more likely to lead to sales •	5 7% of people think email is spam unless it is directly relevant to them I hear relationships are key to success in the affiliate marketing industry, yet our communication style is typically “email first.” If your email’s tone is misinterpreted, it can lead to unnecessary heart attacks. I have found that a quick call, especially to clients, can lead to clarity—and a return to a normal breathing pattern. You could save considerable time by picking up the phone instead of emailing back and forth to set up a call. It’s probably apparent I am pro “phone calls.” But phone calls aren’t inherently more effective than email; there’s an art to using them to build better affiliate relationships. Here are five best practices. 2. Know Your Purpose Plan your call. A little casual talk is key to building rapport, but be respectful of the other person’s time. Make sure it is a good time to talk, then get to the point. Be sure your call is valuable to the affiliate, whether you’re sharing an exclusive partnership, optimization opportunity, etc. When people answer, you want to show them value so that they will answer your call the next time. 3. Know Your Program Be sure you know the pertinent details of the program you are calling about (i.e. commission rate, return days, conversion rate and average order value), as well as where on their site your program would be a good fit. 4. Follow Up After The Call If you have a conversation, send a follow-up email recapping the call to make sure you and the other person came away with the same understanding and next steps. 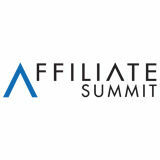 1.Know Their Time Zone As the affiliate industry continues to grow globally, time zones matter. Make sure you know what time of day it is for the person you are calling. One of the biggest pain points for modern marketers is creating quality content faster. You know what I tell them? Stop creating content. Think like a CEO, not a blogger. Last year, it was reported at ragan.com that twice as many bloggers are now spending six or more hours on an average post. Plus, to rank on Google in 2019, your content needs to be high-quality, image-heavy, SEO’d (search engine optimized), and tailored to user search intent. And not only that, quality content alone isn’t enough. Your website needs backlinks to prove that you’re an authority in your niche. Scared off yet? You shouldn’t be. By thinking like a CEO, and not a blogger, you’ll spend your time more effectively, pump out more content in less time, and build your online influence like never before. Create Content Systems The first step is to dial-in your content processes. If you’re currently doing everything yourself, immediately stop and rethink how you’re spending your time. It’s simple - separate your process into two distinct areas. 2. Writing If you were a stakeholder and hired a new CEO for your startup, how would you feel if they sat at their computer all day writing content? You’d probably lose your mind. So don’t write everything yourself. Leverage ghost writers instead. These are hired writers that create content under your name. Is this dishonest? In one public relations study, 76% of respondents said that as long as the idea originated from the author, ghost writing is just fine. So who actually writes the content? Anyone but you. The market rate for content is between $0.10 and $0.35 per word. Because the Internet is teeming with quality writers, finding a freelancer or content company to work with is easy. Down the road, when you become influential and can pitch high DA websites, writers may give you free content if you allow strategic link placement in these articles. You heard that right. Content writers make money by placing links for their clients and you get free articles written under your name. It’s so simple, but it’s a tactic few people use. 1. 2. 3. 4. Act like a CEO by starting real relationships with other influential blogs. First, create a list of the top high Domain Authority (DA) sites you want to work with and build your list of prospects. Find their contact information, email them, and ask if you can contribute a guest post. The goal is to build enough sample content and relationships to eventually contribute 20 guest posts per month. How is that possible? Chris Tradgett is co-founder and CMO of Publisher Discovery. Measurable improvement to maximize app revenue is the goal all marketers are looking to attain. It is achieved through measuring proper key performance indicators (KPIs) in mobile app marketing. If you can measure it – you can improve it, and further track the improvements over time. The key performance indicators depend on different factors that influence which KPIs you are measuring – subscriptions, offers, niche, app usability, etc. It takes time to establish which will provide the most beneficial insights and take your app to the next level but here are some to keep. The four most crucial parameters every mobile app marketer needs to look at to impact the future for a better shot at success are churn rate, average revenue per user (ARPU), daily active users/monthly active users (DAU/MAU) and customer acquisition cost (CAC). Churn Rate Churn rate tells you the percentage of users who decided to quit using your app, within a particular time frame. You are looking to have a lower percentage than your growth rate, if it is not – it is time to start looking at potential reasons they are not staying with it. Aim to constantly monitor churn rate to trigger actions to fix it early as you discover significant changes. The daily or monthly average number of active app users can tell a lot about the users. Which days are they most active on or any other patterns that can provide an insight into user behaviour – adds valuable information to create a stronger competitive advantage. ARPU To understand how valuable your users are, it is important to measure the average revenue per user, that shows the ratio between the lifetime revenue of the app and the number of lifetime users. If you sell monthly subscription or however often a user is expected to use your product, use that as your time frame or whichever period suits your business model. If you’ve been in business for almost any length of time, you’ve probably heard the saying, “Build your know, like, and trust factor with your customer.” It’s been the guideline for converting leads into customers and is still a standard we all attempt to meet. Let’s cover how you can follow this guideline, raise conversion, and spend next to nothing. 1. T  his process begins with the brick in your pocket or on your desk right now. Yes, your phone or the person’s phone who’s in charge of following up with leads, can help you start building a relationship and developing those leads into customers. You’ll want to develop an automated process for your lead manager to contact your leads through text messages. You can hire out a customer-relationship management (CRM) for this process, or do so manually depending on your lead volume. Always start by introducing yourself or the company and explain why you’re texting them. You’ll want to make sure you’re also contacting your leads in multiple ways, and all at once. The more often a potential customer sees a product or service they’re interested in, the more they become they become accustomed to it. Influencer marketing is nothing new (it’s been called PR for decades), but over the past few years, it has become more widely applied as a pure digital marketing tool. This being the case, brands need to know how to leverage influencer marketing in order to drive up measurable actions that lead towards conversions. Using influencers within your industry or that cater to your target audience can help build strong search signals for key conversion pages, which will help boost those pages when it comes to organic search results for individuals looking for your product or service offering. The key, in this case, is to focus your influencer content on relevance in search. While influencer marketing offers a number of mechanisms through which conversions can be driven and optimized, these are four examples that any brand - large or small - can begin leveraging today. Build Recommendation Engines Peer recommendations have long been the most trusted source of referral traffic when it comes to new users or customers. Every year, we are presented with data like the Edelman Trust Barometer showing growth in peer recommendations as the leading generator of loyalty based referral conversion. As trust among consumers goes up, so does awareness and willingness to convert, particularly with new audience members. Using influencers to share your products and services helps highlight honest insights about what you are offering, and leads to the growth and strengthening of your recommendation engines across the web. Increase Website/Store Deep Linking When it comes to SEO (Search Engine Optimization), building deep links to data collection pages and conversion/purchase pages can be a somewhat difficult task. These pages tend to offer little in the way of search value, so creating a backlink ecosystem to drive up the presence of these pages in search is hard to do; that is unless you’re working with influencers that can create content around those specific pages. Muchlike peer recommendations, brand advocates are some of the strongest sources of organic referral that exist in the marketing world. By leveraging influencers and including them in your communications strategy, you have a greater chance of cultivating honest brand advocates that stand by your products or services even after they have been asked to try them as part of a structured campaign. This builds your organic presence and helps shorten paths to conversion by creating an avenue for direct referrals from industry influencers that have garnered significant trust among their audience members. Building a lead form landing page is a carefully constructed formula to ensure your consumers convert. And, just like landing pages, lead form design is an art. Every component making up the lead form and landing page is a piece of the puzzle guiding a consumer to fill out the form to convert. Each piece needs to match one another creating a fluid user experience. To help create the best user experience for your lead form, try using the following optimization hacks. Don’t Neglect Placement Above the fold real estate is a prime place for your lead form. This area has increased engagement and receives the most visual exposure. Having important elements of your website above the fold will help catch your consumer’s eye. To make it even easier, try placing an additional lead form below the fold to provide consumers the opportunity to fill out the form when they want, without having to scroll back up to the top. If you don’t want to have an additional lead form on your page, try using light boxes or pop-ups below the fold. Making the process as fluid as possible for the user is the key to lead form success. The more compelling and clear your CTA (call to action) is the more likely consumers will convert. With a strong CTA, you can compel consumers to fill out the form. The CTA on your form can be a major deal breaker, so if you’re not sure which CTA is best, test a few out to see which one performs best. Large amounts of text on a page can be overwhelming. Give clear and concise information about what your business offers so the consumer doesn’t have to wade through endless blurbs of text to get what you could have just listed out in a few bullet points. Less is more The less form fields you have the more likely a consumer will fill out the form. Let’s be real, when someone is looking for a service or product they don’t want to fill out a long, tedious form. The general rule of thumb is to create forms that are between three to five fields long with as few required fields as possible. If you are unable to sacrifice your form fields, try using a multi-page form. Having one question per page will appear less daunting to consumers compared to a form with 10 fields on a single page. Buying traffic is expensive. When a potential customer wants to buy your product, being unable to convert the sale is frustrating. Online merchants, especially those in high-risk industries, are accustomed to 70% conversion rate at checkout. Understanding decline messages is imperative to increasing your sales and monetizing your traffic. Here’s how to get started. Perform a Declined Transactions Audit A low order approval rate means you are losing money. Combat this by investigating why your transactions are declined. To start, simply pull a report of all declined orders from your gateway. Sort decline reason codes then review and implement solutions by learning what each message means. For example, “Invalid Address” indicates a mismatch of billing and credit card holder information. Instead of doing a complete address verification, did you know you could do a partial address verification by matching the zip code only? Customers may misspell their street and cause a decline. Also, digital product merchants don’t need full addresses. Understand Your Existing Traffic Learn how to convert your current customers. If your converting traffic comes from a certain country, state, or territory; determine what they use to pay and add missing payment types to your checkout process. If you have a European merchant account, United States (US) debit cards likely decline, so it is important to find a solution to accommodate those cards. The same goes for US merchants and European Union (EU) debit cards. Adding alternative payment methods such as automated clearing house (ACH) in the US, Single Euro Payments Area (SEPA) in Europe and cryptocurrency options can easily increase your conversions. If your customer declines with an “Insufficient Funds” message, offer another way to pay. Tell Customers Why They Were Declined Showing your customer the reason their purchase was declined may help them find their own solution. Instead of simply displaying: “Your Order Cannot be Processed”; try telling your customer the specific reason, such as “Insufficient Funds” or “Invalid Card Number”. Your gateway provides these details; it’s only a matter of mapping each reason code to the proper description for your customers. While displaying the decline message, give your customers the option of contacting you by phone. Having a customer support agent speak directly to your customer increases the likelihood a sale will occur. Whatever you do, don’t leave customers in the dark. Mastercard is updating policies used to regulate merchants who sell physical products with a free-trial billing model. These updates could have an impact on your business. Here are five things that can help you prepare for the transition and ensure compliance. Several policy updates are designed to increase transparency and open lines of communication. For example: •	Your cancellation policy must be easily accessible. •	You need to share cancellation instructions when the free trial period ends and after each subsequent transaction. •	You must send written confirmation to the shopper after the subscription has been cancelled. If you weren’t doing these things before, adopting these practices could cause an influx of activity in the customer service department. Make sure your team is prepared to provide prompt, courteous, accurate attention to your customers so you can resolve issues without chargebacks. If your business has all of those characteristics, you’re required to comply with new regulations. Make sure you have a complete and accurate understanding of what’s expected. Understand Why the Rules Were Changed Mastercard made these changes because of ongoing complaints from cardholders and regulators about deceptive merchant activity. These policy updates are intended to create more consumer-friendly commerce. Digital goods, non-nutra products, and straight sales aren’t regulated with these same expectations because they don’t receive as many complaints. Rules aren’t as rigid, and compliance isn’t as challenging. However, it is important to note that selling tactics Mastercard has deemed undesirable shouldn’t simply move to a different industry. If they do, stricter regulations will similarly follow. Make Sure Your Customer Service Team is Prepared If these rules unfold as Mastercard has envisioned, your cancellation requests should increase and your chargebacks will hopefully decrease. One of the new rules stipulates that you’ll need to obtain the cardholder’s consent for the transaction amount after the trial has ended, but before you charge the card. There are no universal best practices for adhering to this rule. You’ll have to figure out through trial and error what works best for your business. Split test a couple options and monitor to see which strategy has the highest conversion rate. Katy Atlas is Wickfire’s Chief Strategy Officer and General Counsel. In 2018, Mastercard implemented new mandates for merchants, one of which was designed to reign in the proliferation of free trial offers with recurring billing, also known as negative option billing, that had become a growing source for chargeback claims. 8. This change was driven by a rising number of complaints from cardholders who felt they were misled by free trial programs featuring celebrities or offers that didn’t have clear terms and conditions of signing up for the free trial. This was especially so for health and beauty products sold over the Internet. Highlights of the MasterCard Mandates: 1. Merchants need to inform cardholders the exact terms of sale, merchant name and the date of recurring charges prior to processing a sale. Instructions for cancellation need to be made clear and accessible to the cardholder, both on the website and in correspondence. When a cardholder cancels, the merchant must provide written confirmation of the cancellation so the cardholder knows their card will not be charged again. The free trial period must begin on the day the cardholder receives the product or service, not the day the payment clears or the day the cardholder registers for a user account. Companies that use negative option billing will be classified as high-risk merchants. Acquiring banks will be required to register negative option billing merchants through the MRP (Mastercard Registration Program) to ensure that they follow the new rules. Negative option billing merchants will be assigned merchant category code: 5968 Direct Marketing – Continuity/Subscription Merchants. These merchants must get cardholder authentication prior to processing their payment every time. Merchants cannot be involved in load balancing to offset high chargeback ratios or payment processing limitations. Merchants can make up to four rebilling attempts only. If the card is still declined, the merchant must get written authorization from the cardholder prior to billing. I have noticed everyone seems to be looking for the ‘big secret’ to SEO (search engine optimization). Truth be told, there are is no ‘big secret’, just a set of simple strategies which we used to bring a site’s traffic from 2,732 monthly visitors to 38,420 in eight months. Case Study Site Information It was an affiliate website that reviewed weight loss supplements and targets the United Kingdom and the United States. The goal here was to increase website authority and achieve first-page ranking. But we were up against an extremely competitive niche, and we were competing with well-known brands. However, we found a weakness. Our Plan of Attack We discovered that competitors dominated with their domain authority, but we could compete with page level authority, and so we built our strategy around that. We had three stages which were to get the technical SEO on point, then create awesome content which helps people, and finally build links. Case Study In Action We broke our strategy down even further. We started with keyword research and entered our seed keywords to a few tools to get a huge list of keywords, and then filtered out any that weren’t relevant and didn’t meet the intent of our site. Next, we focused on competitor analysis. We searched for the main keyword and pulled the top five competitors, then reviewed how they monetize their site, their purpose and intent, page layout and content length, which of their pages rank, and their use of multimedia. We then carried out an onsite audit where we tackled things like page speed, duplicate content, and internal redirects, and found a huge problem with thin content. Niches do vary but this niche is content heavy. Website structure was our next focus. A good website structure should mean your visitors can get from your homepage to their destination page within three clicks, but this was not the case with our client, so we overhauled the website and built it under this principle. We had already learned that our websites content was too thin, so as part of our content strategy we produced two articles a month which were heavy in content, solved a problem, and fit in with the primary keywords. Internal linking helped us utilize the pages with authority to direct link juice to pages that needed a boost. We also played around with a few plugins which meant this became an automated process. Finally we worked on link building. We outreached to relevant websites who had the domain authority we needed, and with a little help from a PBN (private blog network), we got 76 links. When someone searches for your personal name or brand in Google, what will they find? On the Internet a first impression is everything -- and more often than not, Google is providing that first impression. While most people think whatever ranks at the top of Google is likely the most accurate and useful information, the majority of us within the industry know it’s all about search engine optimization (SEO) and site ranking power. Most of us should also know that we don’t need to take what ranks at the top of Google simply for what it is -- and instead, should control our own destiny. With that being said, let’s dive into a few helpful tips on how to improve your brand reputation, search rankings, and first impressions being delivered through Google. Having a Domain Name, Website, and Blog is Goal #1 The most obvious and easy way to rank at the top of Google for your name, is to have a domain name (matching your name), and to also have an active website or blog on it. With real content, traffic, and backlinks flowing through your site, this is the best way to have total control over what ranks #1 for your personal name or brand in Google. Social Media is the Path to Multiple Page 1 Rankings In addition to having a website of your own, social media is the next best solution. Google loves websites like Twitter, LinkedIn, Instagram and Facebook, which makes it very easy to rank these pages. Just like your domain name, try to have your account usernames and page uniform resource locator’s (URL) matching that of your personal name and brand. You should also create a unique profile for both your personal name and brand name. If these profile pages aren’t ranking on the first page yet, start sending some quality links and social shares to see them start creeping up. I first learned about the 80/20 rule concept while going through the certification program with Constant Contact in 2006. This process qualified me to become an authorized local expert, available to speak on the topics of social media and email marketing. I love that statement. My daughter actually gave me a bracelet with that on it. I earned it. It was not “given” to me freely. Keep this in mind while thinking about the 80/20 rule. You have to earn the right to market items to your audience. Yes, crazy but true. Believe it or not people do enjoy taking a look at the food you’re eating and the places where you’re eating. In fact, the most popular food on Instagram is pizza and the next is sushi according to the Omni Core Agency. So next time you’re enjoying a lovely slice of pizza or a bite of sushi, snap a photo and share it with your followers. Start a Conversation Make it fun and personable. They don’t call it “social media” for nothing. Get social and share a bit of you. People will WANT to buy your product after they get-to-know your posts. Once they see that you’re not a fly-by-night kind of social media account, you will earn their trust. Did you know that an estimated 70% of images posted on Instagram go unseen? Instagram posts don’t disappear after 24 hours, but they do get buried, and in most cases lost from view forever. So how do you stand out from the crowd and grow your account? As the founder of a digital marketing agency and the Chief Marketing Officer (CMO) of Hashtracking.com, I spend a lot of time evaluating social media accounts and studying the impact of artificial intelligence (AI) in account growth and discovery. While I consistently recommend Instagram advertising to clients looking to grow their accounts and increase their engagement, organic growth is still possible on Instagram. Hashtags are integral to almost everything you do on Instagram. Even if you aren’t using hashtags in your posts, Instagram’s AI (artificial intelligence) is studying how you use hashtags. When you follow an account, like a post, comment or engage, the AI recognizes and remembers when you engage with a hashtag. The AI looks for patterns in use of and interaction with hashtags. These patterns help Instagram deliver personalized content to users, based on their relationships and activity. Instagram currently allows up to 30 hashtags per post. There are many differing schools of thought about how many hashtags to use, but the studies don’t all agree. This is probably because the quality of the hashtags used is at least as important, if not more important, than the quantity. I advise using all 30 hashtags if you can identify the appropriate hashtags for your post. Why not take advantage of every opportunity for discovery and engagement? But every hashtag should be there for a reason. Don’t use hashtags gratuitously or inaccurately as it will hinder the growth of your account. It was the fall of 2014 and my beloved Kansas City Royals were headed to the World Series for the first time in 29 years. It was that same year that I got to know Noah Wilson. Noah was a six year old boy in my neighborhood. Earlier that year he was diagnosed with Ewing’s Sarcoma - a form of cancer. Noah immediately left his mark on my heart and so many others. You see, despite him going through treatments and chemo, he was always thinking of other people. He started Noah’s Bandage Project, which allowed for people to donate colorful and non-boring bandages to hospitals. It was his way of helping others, despite going through an unimaginable disease. Noah was a big Royals fan and my first thought was getting him to the World Series. I texted Noah’s dad and said “I’m going to get Noah to the World Series. I have no idea how, but I’m going to do it.” I had huge aspirations and little funding, but I had hope and Noah’s passion to push me. That next morning I started a GoFundMe for Noah, told his story, and tweeted it out to everyone I could think of. What transpired the next 72 hours was nothing short of a miracle. The GoFundMe went viral and over $15,000 was raised. Major League Baseball and StubHub reached out and offered tickets to Noah and his family to attend the World Series games. Amazingly enough, now that they had free tickets to all the games, the Wilsons decided to spend a majority of the money raised to purchase tickets to the World Series to give to other families with children facing terminal diseases in the area. So why am I telling this story? We are all Internet marketers by trade. We eat and breathe and live this industry. Use your powers and knowledge for good and make a difference in someone’s life. Attendees Registration & Exhibit Hall Space Registration is Open Now!